If the carpenter ants are actually living in the building, are there any structural problems that are contributing to the carpenter ant problem? You can be pretty sure there's a moisture problem, but how about things like tree limbs touching or overhanging the house? Ideally, the best treatment would be one that delivered a precise dose of just the right insecticide into just the right place: In other words, right smack into the center of the nest. Exterminators often refer to this as "hitting a home run" or "hitting the jackpot," because finding and directly treating the nest makes for a quick, easy, and effective carpenter ant job. Usually, however, finding the actual source of a carpenter ant infestation is more difficult, and treatment requires some detective work and sometimes even some outright guesswork. Fortunately, it may not be necessary to locate the nest. Unless you know that the carpenter ant nest is inside your home and that they're not just coming in to eat, I recommend that you start by treating the outside of your home using a good carpenter ant bait. My favorite product for this is Advance Granular Carpenter Ant Bait. 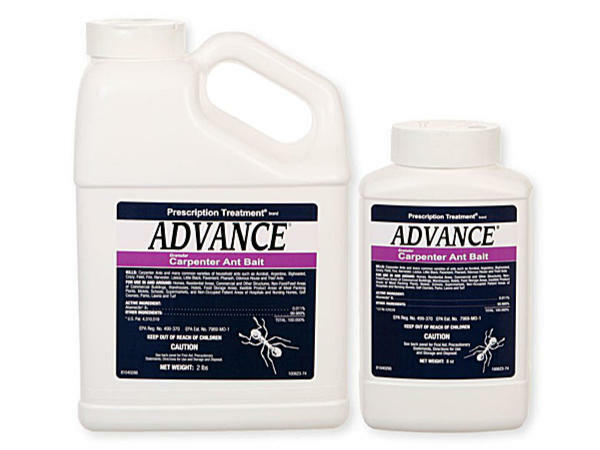 Carpenter ants don't readily take baits, but Advance is one of the exceptions. There are two reasons for baiting the outside of the house first. The first reason is that in many cases, the carpenter ants that are seen inside of a house actually are living outside, such as in a tree, utility pole, or woodpile, and are only entering the house to get food. In these cases, treating the inside of the home itself usually is unnecessary. The second reason for starting by baiting outside the house is that even if the nest is inside the home, there's a pretty good chance that the Advance bait will solve the problem. Advance doesn't kill carpenter ants on contact. They carry it back to the nest, where the whole colony eats it; and in most cases, the whole colony dies. Advance bait is easy to use. You just sprinkle it on the ground in accordance with the label directions. Obviously, you should apply it when the weather forecast calls for dry weather for a day or two. The bait also loses its palatability after a few dry days as the aromatic attractants offgas, so you may need to do several retreats before the nest is eliminated. If you have no idea where the nest is, then sprinkling the bait outside your entire house is a good place to start. You may also want to sprinkle it around trees, railroad ties, and other likely nest locations. If you know for a fact that the nest is in a certain tree, woodpile, or similar area, then you can probably get away with just treating that area with the bait rather than treating around your home. Carpenter ants nesting inside a building mean that there is or has been a moisture problem. In some cases, addressing the moisture problem will be all that is necessary to clear up the infestation. But even if it's not, you should always clear up the moisture problem before addressing the carpenter ant problem. First of all, the water will cause more damage on its own than the carpenter ants will. Secondly, water degrades most insecticides. Trying to treat an area that's still wet is a waste of time and very likely will result in a failed treatment. The long and short of it is that if you have carpenter ants inside your home, look for the moisture problem. When you find it, have it fixed by a competent carpenter or roofer; and only then start treating for carpenter ants. It may be that there used to be a moisture problem, but it's since been repaired; but there are still carpenter ants in the formerly-wet wood. That's not unusual. In that case, you should have the wood evaluated by a competent builder or engineer to make sure it's still structurally sound. If it's not, then have it repaired. If it is, then you can proceed with your carpenter ant control job. If you can have a good idea where the nest is and can identify the trail the ants are using to get there, you should at least consider trying a granular or gel carpenter ant bait as your first control method. Many granular baits and almost all gel baits for carpenter ants are labeled for indoor use. In accordance with the label instructions, place the bait along the ants' travel paths as close as possible to where you believe the nest to be. You want them to find it and carry it back to the nest. Remember that ants leave pheromone trails to help them find their way back to the nest, so place the bait as close to the existing trails as you can, but not right on top of them. If you have children or pests in the home, however, make sure to place the bait where they can't get to it. Most likely the ants will still find it. It will just take a bit longer. If you want to use a granular bait indoors, I suggest the same product I recommend for the outdoors: Advance Granular Carpenter Ant Bait. It does smell a bit fishy, however; so if you're very sensitive to smells, you may not want to use it indoors. Cats and dogs also seem to like it; so if you have a cat, dog, or any other free-roaming pet, either use a gel bait or place the granular bait in areas the pets can't get to. I've never seen it hurt an animal, but why take chances? I've had very good success using Advance Carpenter Ant Granular Bait in bait trays on the sill plates of unfinished basements without ever treating the actual nests. I've also had good results placing it in roof soffits, either from inside the attic, or by unscrewing the soffit vents and placing the bait through the openings. Just place the bait where you observe the greatest amount of ant activity. If you see even one ant pick up the bait and carry it back to the nest, you're golden. That ant will lay a trail to the bait that others will follow. If using a granular bait is impractical, then you can try a gel bait. I've had less overall success with gel baits for carpenter ants, but the two that I've had the best success with have been Maxforce Carpenter Ant Bait and Optigard Ant Bait Gel. Both of these gels come in syringes and can be injected into cracks, crevices, and void in occupied spaces, or simply placed along the carpenter ants' trails in unoccupied spaces (for example, on sill plates in unfinished basements or inside roof soffits). When using baits, you should start noticing fewer ants within a few days to a week. If the bait is successful in eradicating the colony, you should see almost no ants after two or three weeks. I say "almost" because you may still get the occasional forager from another colony. If you have a really good hunch about where the nest is, but it's not accessible for direct treatment, you may want to consider using a dust insecticide like Drione or Delta Dust. When using insecticide dusts, always use chemical-resistant gloves, protective goggles, and a P95 organic vapor respirator with a dust filter. One situation in which using a dust would make sense would be when the ants are in a roof soffit, but you don't have access to the soffit from inside the attic. If you peel back the shingles a bit, you'll almost certainly find a small gap between the roof sheathing and the soffit. Blow a few puffs of dust into the soffit every foot or so using a bulb duster. If ants start raining down, you hit the nest. If not, give it a few days. Maybe you got the dust close enough that it will still work. Of course, be careful when using ladders and scaffolding to work up high. Wear a safety helmet and use a properly-secured safety harness to protect yourself from falls. Another place where dusts can be a good idea is in wall voids adjacent to sinks, tubs, and showers. Simply pull the collars around the pipes forward a few inches, blow a few puffs of dust into the voids, and slide the collars back into position. Whatever method you choose to treat your carpenter ant problem, always be sure to read and follow the label instructions and observe all safety precautions relating to use, storage, and disposal. Good luck!